some of my fondest memories are of summers spent in the neighborhood of my childhood. often the setting of the sun meant lightning bugs in jars-dashing about the lawn and scooping the bugs from blades of grass or catching them mid air. some nights we'd just spend talking about amusement parks and our favorite rides. day time was filled with games of freeze tag, swinging statues, mother may i, chinese jump rope, red light green light and grocery store. we were mermaids in the kiddy pool, trapeze performers on the old wood and chain swings and we dined on picnic lunches in the grape arbor with frozen pudding in a paper cup as a treat. times were simple looking back! primitives like those childhood memories capture simplicity and hold it there for a lifetime. recently i found a version of the velveteen rabbit at a thrift store. this is a story that still stirs up a few tears for me. the comfortable love that is shared between the boy and the rabbit, love that is blind to imperfection and in fact almost welcomes it, is a quality that i aspire towards with my work and find appealing in the work of others. its something you feel when you look at a piece and it says "i am me take me as i am -for what i am." 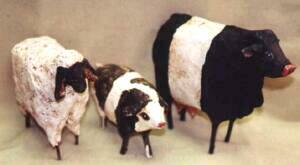 this issue features kay cloud, a missouri based artist known for her folk art dolls and saw dust compound sculpture. 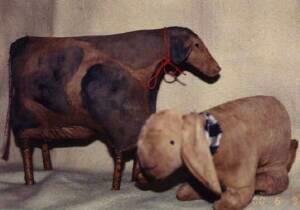 she is inspired by authentic old dolls and has researched them as well as her other mediums extensively. i really enjoyed talking to her on the telephone. she is just one of those people i could listen to for hours and never grow tired of! her constant "evolution" as a folk artist is something i find inspiring, she demonstrates well that the ability to know when to change is as important as being able to make the change itself. some ideas for you to toss around for summer! well i talked about the sewn fruit in the last issue, good news! i have a wonderful fruit pattern being added to the seed pod line. while collecting vintage "sewies" can be on the pricey side making your own from inexpensive supplies can be most satisfying. a few other new patterns are being introduced as well so be sure to browse the catalog pages. continuing on the fruit theme- seek out vintage table cloths from the 40's and 50's that feature grapes, strawberries and cherries along with cheery checkered borders and wonderful florals. use them to grace the picnic table or the back of a sofa. they are certainly a happy looking decoration that is relatively inexpensive. paint some large smooth river stones in plain white or pastels (or get creative and add plaid striping) and use to weight your picnic table cloth, beach towels or use as door stops and paper weights. try making some crisp white pillows for your bedroom. embroider the outlines of cherries, farmyard animals, a single initial, even sweet nothings on them. use a mono chromatic (one color) scheme, this would look great in a red work style even blue embroidery floss. use a disappearing pen to draw your outlines and stitch with a hoop leaving enough room to have a side seam and insert stuffing or pillow form. 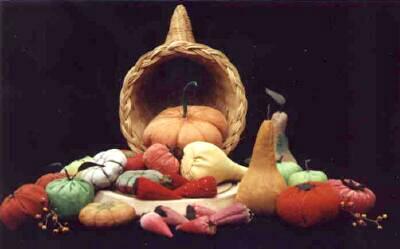 for those getting a jump on fall... continue on the pillow theme- choose a black felted wool and stitch hand dyed felted wool cut outs of fruit to the backing. embellish and add details with embroidery floss and finish as mentioned above. the black background makes the fruit just glow with warmth. every where i look i see balls of string and string on spools displayed in wooden bowls, wire baskets, or tin pans. garage sales are great places to purchase old sewing boxes that may contain spools of string. rolls of old kite string or kitchen string are likely candidates for the string collection too. the wonderful textures and different shades of white and cream make for a conversation piece that won't clash with primitive decor. transfer pattern using light table and pencil or disappearing pen to square of quality muslin or sturdy cotton fabric remember to take into account that you will need to sew around all four edges with a 1" allowance. using a simple back stitch with a few strands of floss to follow the lines of the goose. wording is also back stitched. right sides in sew two squares together using 1" allowance (stitched piece and blank piece). leave opening to either stuff with fleece or cotton or buckwheat hulls or create a small pillow and use embroidered piece as a removable case by leaving one side open and sewing a hem in the open side. alternate: use blue floss instead of red. felted wool: (do this before dying any pieces) place 100% wool in washing machine on hottest water setting. (this will be done for the black wool for pillow front/back.) allow to agitate for 3-5 minutes. spin out all water. rinse & agitate with coldest water setting for 5 additional minutes. spin out water and machine dry. dyeing wool: after the felting process, wool can be colored using store bought fabric dyes such as "rit" brand. dyes can be mixed or layered to form a variety of deep colors. a high concentration of powdered dye results in richer colors especially if dyed on the stove top over a medium heat. allow dye to cool before removing fabric. you can make this pillow any size you want. keep in mind that there is a 1" allowance all the way around. the pieced left side needs 1/2" extra on the(height) top and bottom of each block to sew together and 1/2" added to the width to attach to black wool front of pillow. cut out entire shape for each fruit. pin pieces onto pillow for best placement. mark with chalk. use small stitches to sew to( black) front of pillow. start with the fruits that are "underneath" and work forward. add the stems and stitching in the banana using embroidery floss. the side piecing is alternated brown and gold wool squares machine sewn together with a 1/2" pressed open allowance. the allowance for sewing pieced side to the black front is also 1/2". sew right sides together open then sew to back. the back piece is also black and is as large as the black front plus the pieced side. sew front & back right sides together and finish as with red work pillow. a shadow box, a wooden bowl or glass dome might be a few ways to display old sewing accessories. the top of a shelf or cupboard is a good place for them as well. since these were items of everyday life it's a plus if they can still be used, however those with stressed fabric that is breaking down are best kept away from direct sun and being handled. curds & whey why it's cottage cheese! vintage characterized by excellence, maturity and enduring appeal; classic. 2. old or outmoded. emery a small closed pouch filled with fine sand like material used to keep needles sharp by passing them in and out thru the pouch into the sand. emery is what is placed on cardboard to file nails too. "married" slang term meaning that the components making up a piece (generally an antique) are not original to each other but work as one to make the piece whole. an example would be if a lid to a green hinged box was missing then later a blue lid and hinges were put to the box that fit it exactly. this would be considered a marriage. bee a social gathering where people combine work, competition and amusement. example: quilting bee. summer kitchen an out building usually a few feet away from the main house for cooking during summer months to keep the main dwelling from getting too warm. and if a cooking fire occured chance that the main house would burn down was less of a threat. keeping room term used for the kitchen in early colonial days. the houses had one large room used for eating, cooking, and working. adults and babies slept in the keeping room- often with hide a way bedding that was put away during day time, the older children may have slept in the attic. smoke house a structure in which meat or fish is cured with smoke. sometime in 1982 kay, who reads few magazines, was glancing through a country magazine when she came across an article on museum dolls. her first reaction was that the dolls were truly ugly, but something about their simplicity made her curious. kay soon had sewn her own version of the magazine dolls. when a neighbor saw the calico and lace kay had used she remarked that the dolls were "cute and homey" kay decided that they just weren't "right" and started over. as she continued to perfect her version of the dolls she also sought out books on these historical dolls at auctions and flea markets. 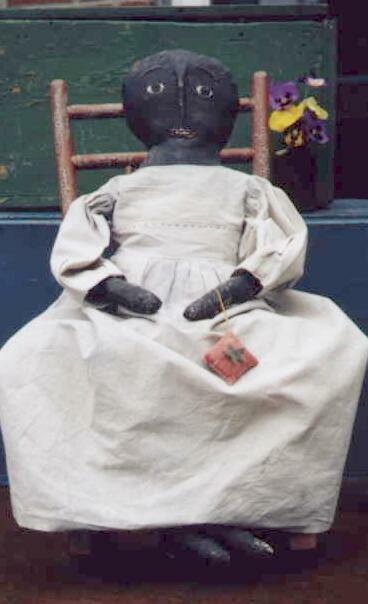 she learned that the really old dolls were stuffed with unneeded materials such as saw dust and started doing so herself. kay and husband ray found themselves in a failing oil business in oklahoma and decided to relocate to missouri where ray had been raised. 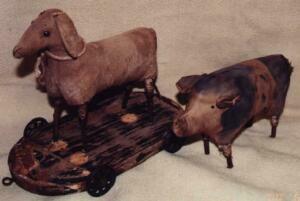 kay parted with all of her old farm furniture and set up shop with 21 dolls hoping to make a go of selling her work. "i didn't have enough sense to know that no one was coming" she says of the early weeks. among the initial customers was an editor of better homes and gardens magazine (TM). over the next few months the word got out and more editors were getting in touch for commissioned work. all the while kay kept at the research, finding very little more than a few paragraphs or sentences at a time on the prairie type dolls. remembering one of the first commissions for a santa kay says that unlike her usually disproportionate dolls the santa presented her with a real challenge. the result was a stump-style santa which ended up to be very popular. perhaps with out knowing it, the santa commission gave kay her first jump from the dolls to something different. before long she was using her own recipe of paiper mache to sculpt over sawdust doll heads and later applied it to the santas. the stump santas were followed by paiper mache historical figures such as benjamin franklin. eventually the stump style dolls were given legs. her next progression from paiper mache enlisted the help of a local potter. with him she developed a formula closely resembling a german recipe from the 1800's for saw dust composition. animals of all sorts, many with stick legs, were created. 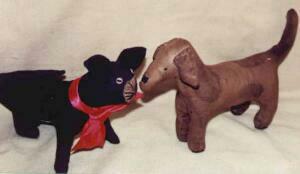 the animals soon were being made of cloth too, with wrapped string making the fabric hold to the sticks. her love for folk art and creating doesn't end with fabric and sculpting- kay loves old boxes and gadgets. her lessons in olde world tole painting gave her the courage to first paint a little scene on a simple cheese box. from there she sought out old wood and tools that she could paint on adding a touch inspired by shakers- an inscription. kay tells me that the shakers would generally tell a story on their paintings to explain the purpose of the piece. her paintings grew to include stories about herself, whimsical sayings even any history of the given article that she could find. besides the brush kay has a way with the pen too, she has done some editing, written her own book and drawn up some wonderful cards. many features have been written on her in national publications -look for one in an upcoming issue of early american home (TM). what a long road since the calico and polyester fill (now considered to be a swear word of sorts) she first began with! so you see, it's by choice that kay is not making so many dolls these days, because she says "ive realized i'm not a doll maker- just that dolls are a part of the folk art that i love ". what inspires kay? "antique books, post cards or just as i'm making a piece". her aspirations? "to have my work still be here in 200 years, to be in the history books "
something to keep in mind: "what else do you do when you've mastered something? -do something new." kay and husband ray have a shop in reeds springs missouri called the saw dust doll. i hear ray has quite a few talents himself such as photography and candle making. if you are in the area stop in and sign the shop wall! special offer while supplies last!! kay cloud's pattern book "creating early american dolls"
is available for $8.50 (includes postage). 32 pages with doll and clothing patterns. see address above. THIS BOOK IS OUT OF PRINT SO ACT FAST IF YOU WANT A COPY! we make a large effort to get permission to list most web sites and company information and make every attempt to list them correctly. if you spot an error contact maria at: seedpod@fuse.net if you need to make a change contact maria. copyright 2000 maria pahls~the seed pod all rights reserved. no part of this newsletter may be reproduced without written permission from the publisher, except by a reviewer who may quote brief passages in a review with appropriate credits; nor may any part of this newsletter be reproduced, stored in a retrieval system, or transmitted in any form or by any means -- electronic, mechanical, photo- copying, recording, or other -- without written permission from the publisher. photographs and articles posted on homespun peddler site by permission of photographers or authors and are protected under this copyright.